A recent study from the Health and Social Care Information Centre (a government body), showed a dramatic rise in Crohn's related annual hospital admission rates for 16-29 year olds. Although some of the increase may be related to changes in how the data is recorded, the results may also reflect a true increase in admission rates in young adults with Crohn's disease. The results were widely reported in the media including the BBC and the Telegraph newspaper. The data covers the period 2003 - 2013 shows a steady and progressive increase in documented hospital admissions for young patients with Crohn’s disease. In fact, between 2003 and 2013, the annual admission rate increased by almost 400%. The study did not examine the reasons for this change in practice. At first glance, the data might appear to suggest that the incidence of Crohn’s disease is increasing. However, a number of other factors may also influence these results. Specifically, improvements in diagnosis and the documentation/recording of the diagnosis for statistics purposes may have had an impact the results. 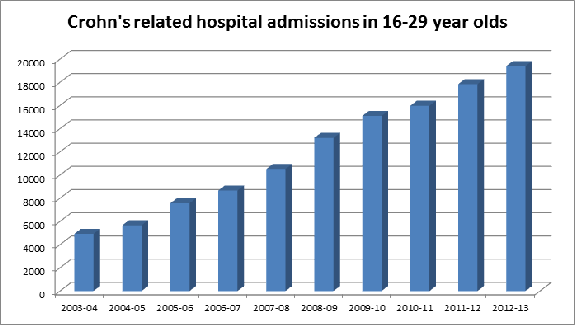 In addition, in the middle of the study period (2006-2007), patients who admitted to the independent sector were also included in the results, which will also have resulted in an apparent increase in hospital admissions. Although it is very likely that changes and improvements in the documentation and recording of the diagnosis will account for much of the so-called increase in admissions over the last 10 years, it seems likely that there has also been a real increase in either the number of young patients diagnosed with Crohn’s disease or alternatively, an increase in the young patients with Crohn’s disease who require hospital admission. This of course begs the question as to what might be causing such a change if indeed it is real?. Environmental factors. Crohn’s disease is very common in Western society and in particular in the UK. Crohn’s disease occurs more frequently in some parts of the Scottish mainland and the Scottish Isles. It is also interesting to note that populations who come from areas where there is a low incidence such as Africa are likely to develop a higher incidence when they have lived in a Western environment for some years. This suggests that environmental factors are contributing to the development of the condition. Some researchers have also begun to examine the role of diet and the development of Crohn’s disease. Early studies suggest that eating a lot of high calorie junk food may play a role. Others have looked at the possible role of antibiotics in precipitating Crohn’s disease. However, there is no conclusive evidence that any changes in diet account for these results. It would be wrong to assume, as has been reported in the media, that eating a “junk food diet” and antibiotic use are responsible. Smoking. Although it’s not clear if smoking itself can cause this condition, there is very good evidence that patients who smoke and have Crohn’s disease may have more severe disease and it is also much more likely to come back more quickly in smokers who have undergone surgery for Crohn’s disease. Genetics – family history. In some patients, there may be a strong family history of Crohn’s disease, or other types of inflammatory bowel disease. Previous infections. It has been suggested that the term exposure to certain types of infection may predispose the development of Crohn’s disease. A lot of research has been performed to look at the importance of early viral infections such as measles. Others have looked at the possible effect of vaccinations. The jury however is still out and we are not entirely clear about the importance of the role of infection in triggering an abnormal immune response. Where can I get more information about Crohn’s disease or ulcerative colitis?